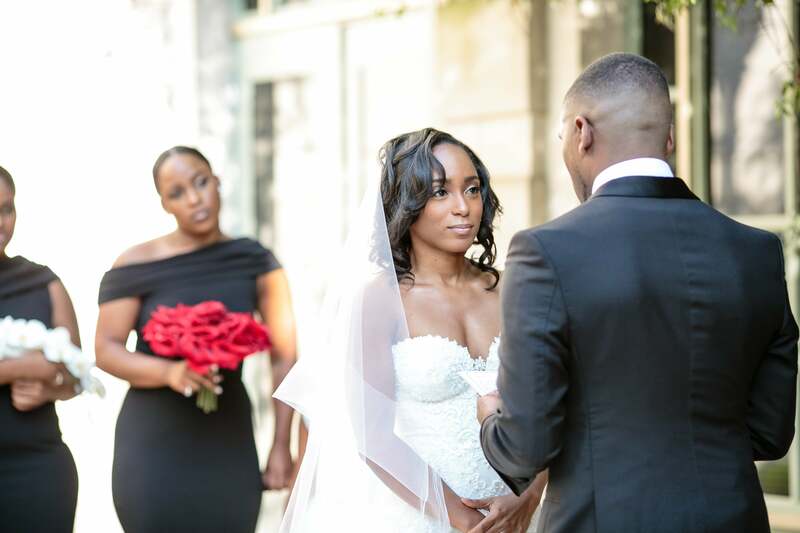 A spontaneous baecation to Montreal sealed the deal for this bride and groom. 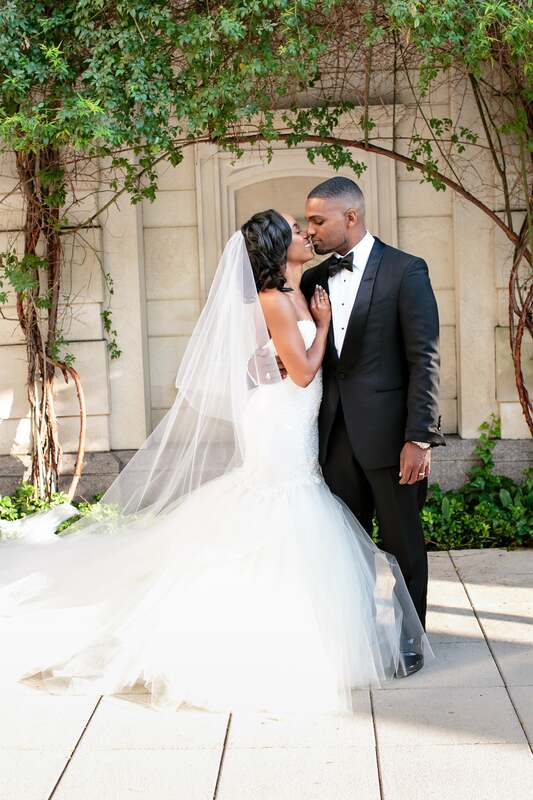 Their wedding photos say it all — take a look! 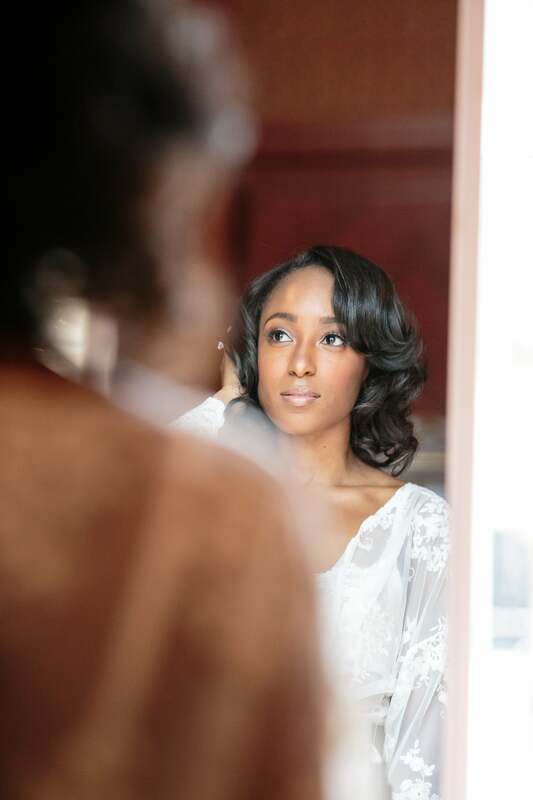 "Being bride was more than I could have imagined," said Kristina. "To be surrounded by family and my closest friends for such an amazing day (and for the two years leading up to it) was such a blessing. I truly have amazing people in my life." 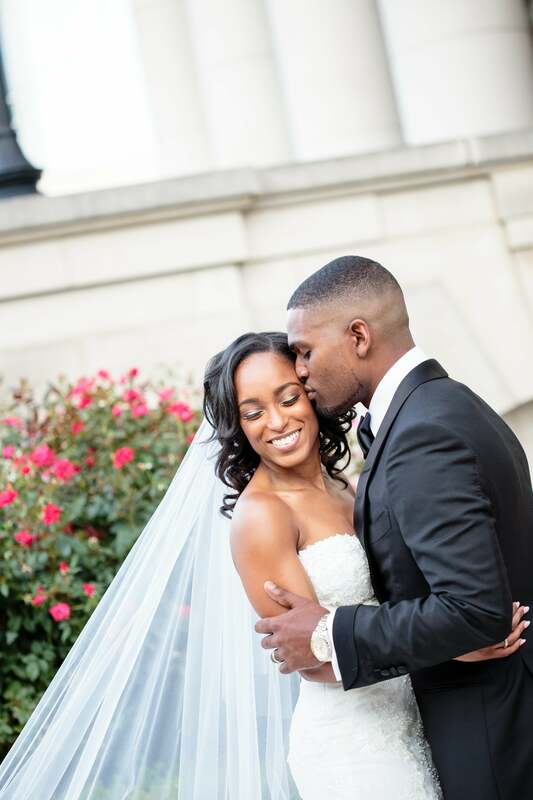 "Trey is incredibly brilliant, driven, caring, nurturing and protective," described the bride of her groom. "He challenges me intellectually, is supportive of my career and personal goals and is my perfect equal." "Early on in my engagement, I purchased a dress that I thought was the one. 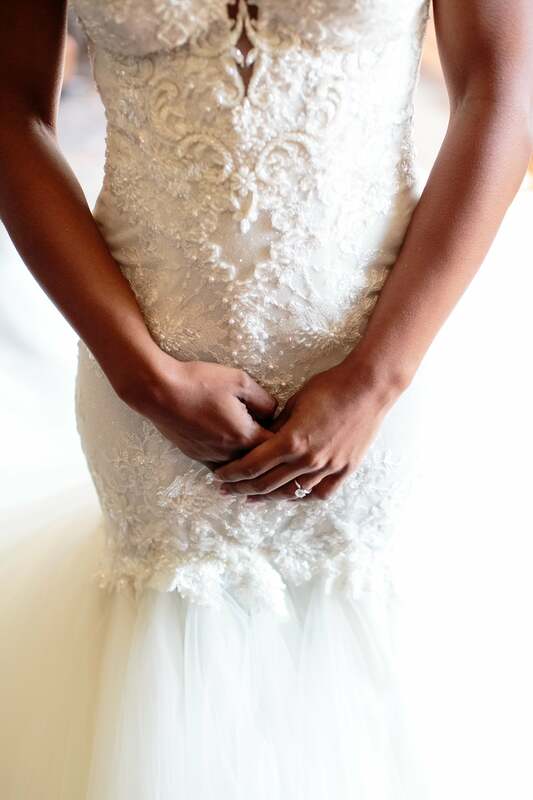 It was a beautiful lace Berta dress that screamed regality. However, as soon as I got home, I immediately regretted my decision. 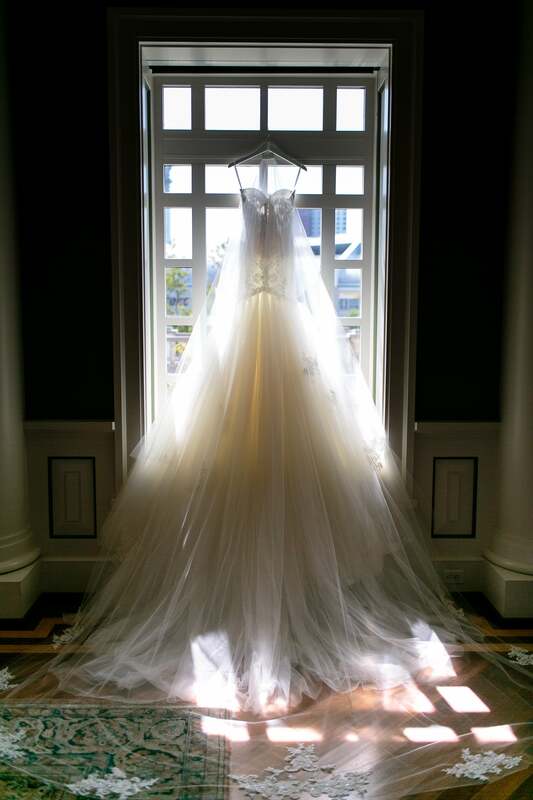 The dress was gorgeous but, it wasn’t me," the bride admitted. 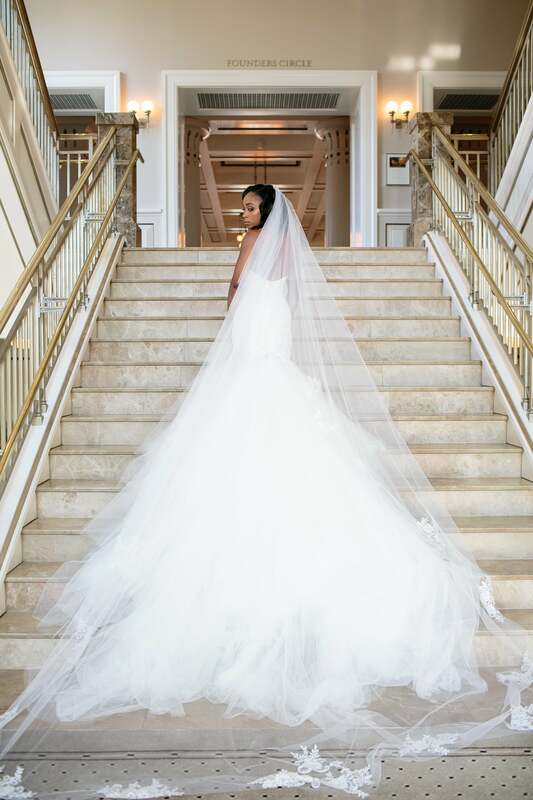 Ultimately, Kristina opted for a custom wedding gown designed by Gaila Lahav and we must admit that it's beautiful! 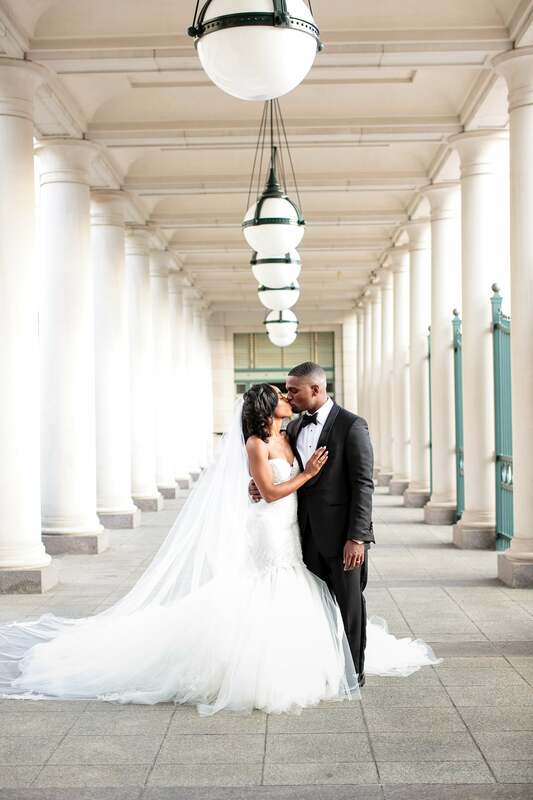 Kristina and Trey realized that they loved each other during a trip to Montreal so to pop the question, the couple returned to the Canadian city. 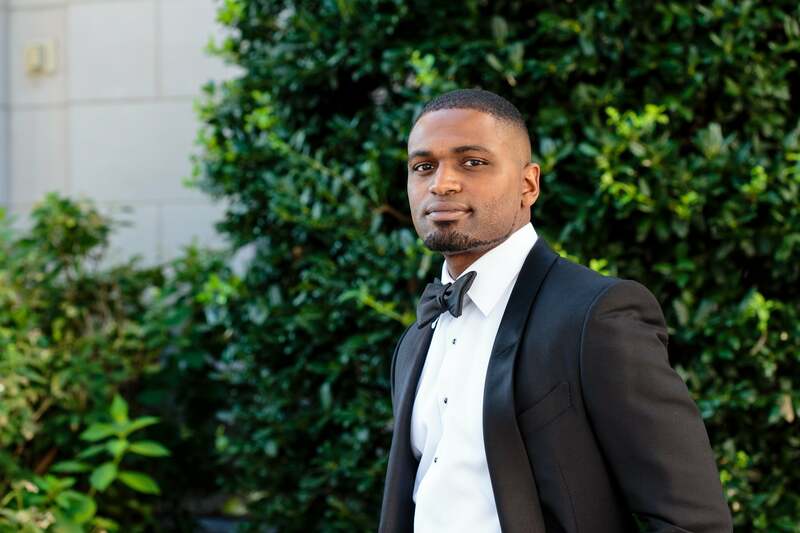 "Trey took my hand in his and began expressing to me how much I meant to him," recalled the bride of when the groom proposed. 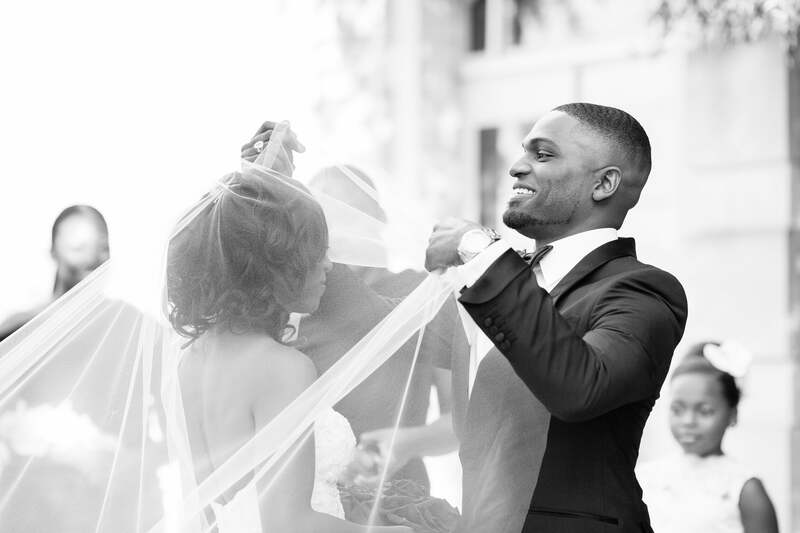 "Before I knew it, Trey was on his knee with my dream ring asking me to marry him! My legs were so weak that I kneeled with Trey to say yes! After spending the weekend in Montreal, Trey then whisked me off to Paris, Ibiza and Barcelona for an amazing two weeks together." 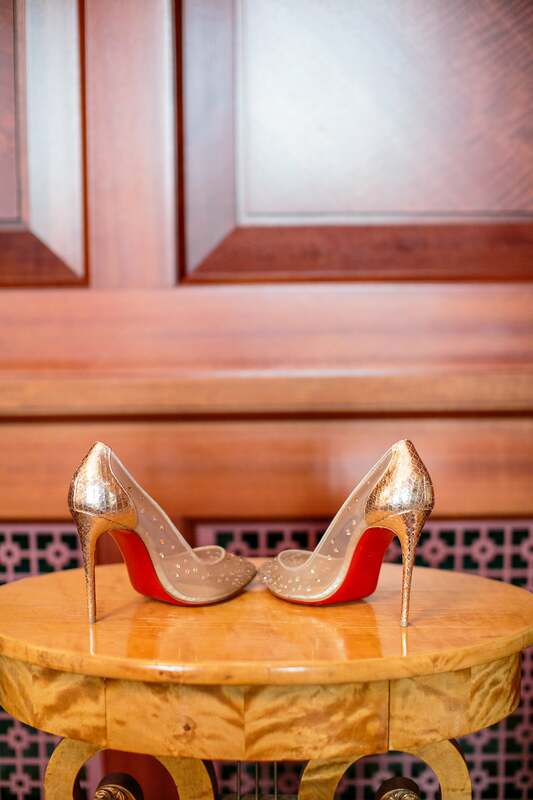 "I wore Christian Louboutin Follies Strass pumps," the bride shared. "They were the perfect golden glass slipper!" "I would describe Kristina as a fighter for what she believes in and what she loves, and because she loves me, I’m a lucky guy," said the groom of his bride. "She’s brilliant, driven, thoughtful and compassionate. She is extremely and fiercely loyal to family and friends and will always have my back. She’s also incredibly beautiful and puts me to shame, but if you don’t outkick your coverage, you’re not doing it right." 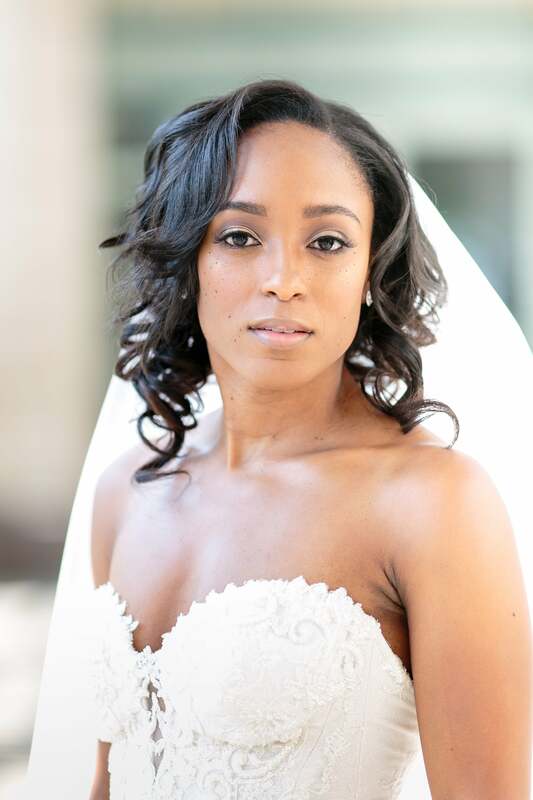 "My veil was a custom lace drop veil by Basia Custom Headdresses in New York and was the perfect compliment to my gown," said the bride. 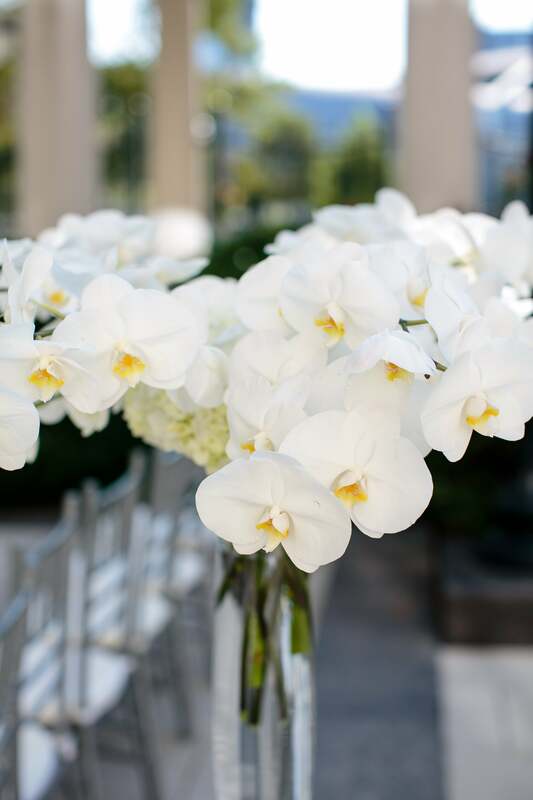 "Our ceremony décor included tall slender glass vases with draping Phalaenopsis orchids lining the ceremony aisle and white orchid blooms placed into the courtyard’s fountain," said the bride. "It was simple but gorgeous and really accented the courtyard’s natural beauty." 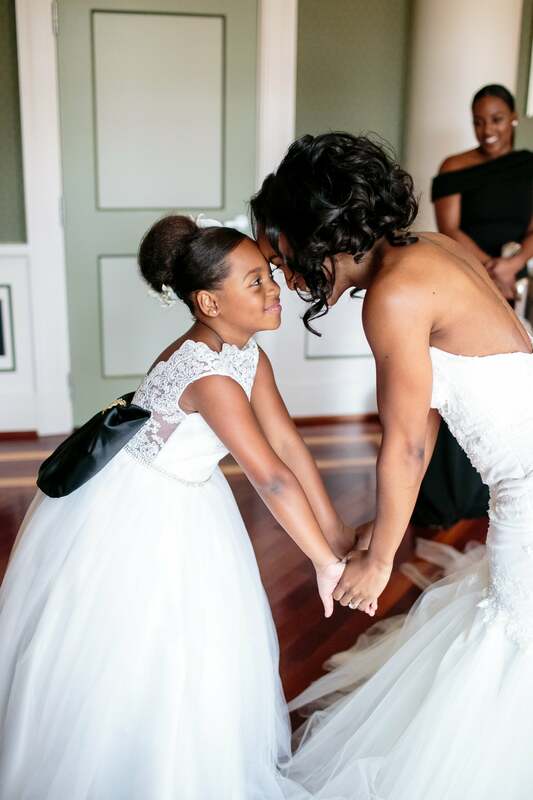 The bride's niece, Jada, was her flower girl and she definitely looked divine standing by her aunt's side! 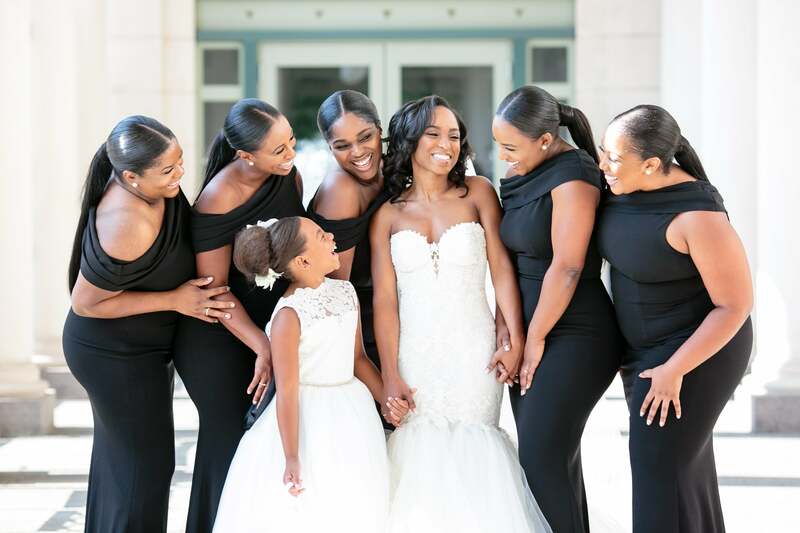 "I really wanted my Belles to have a sleek, polished look for our wedding," said the bride of her bridesmaids' regal attire for her day. 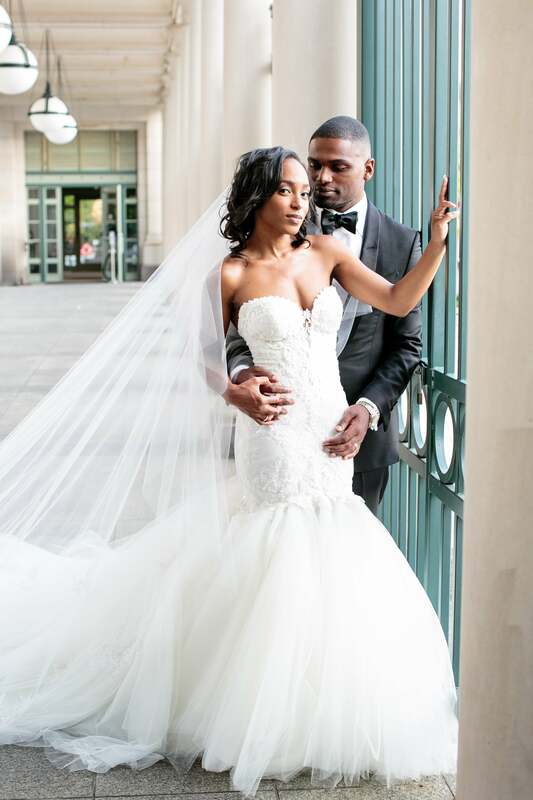 "So I chose, black, one-shoulder gowns by Katie May. They slayed!" "I was never a big believer in 'true love,' and found the notion to be romanticized and cliché," said Trey. 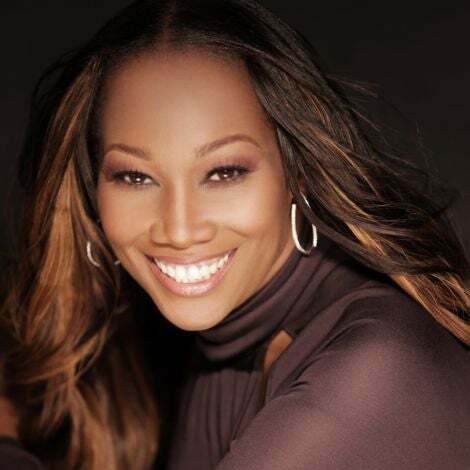 "I thought people searched for the amazing unreachable and overlooked the good attainable, but I’ve been proven wrong. Kristina and my love is true love. I would say I fell in love with her on our trip to Montreal and discovered that our love was “true” after the first couple bumps in the road and the forgiveness that followed." 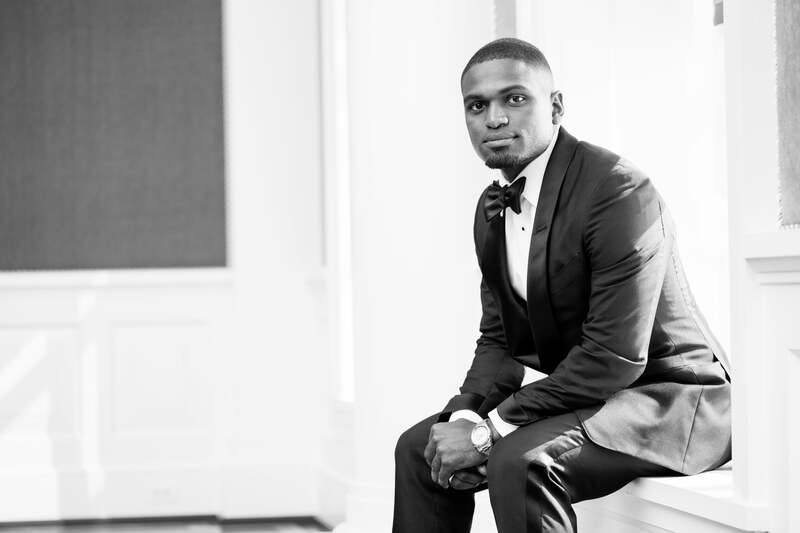 "Having the experience of being a groom was indeed all I dreamed of," Trey admitted. 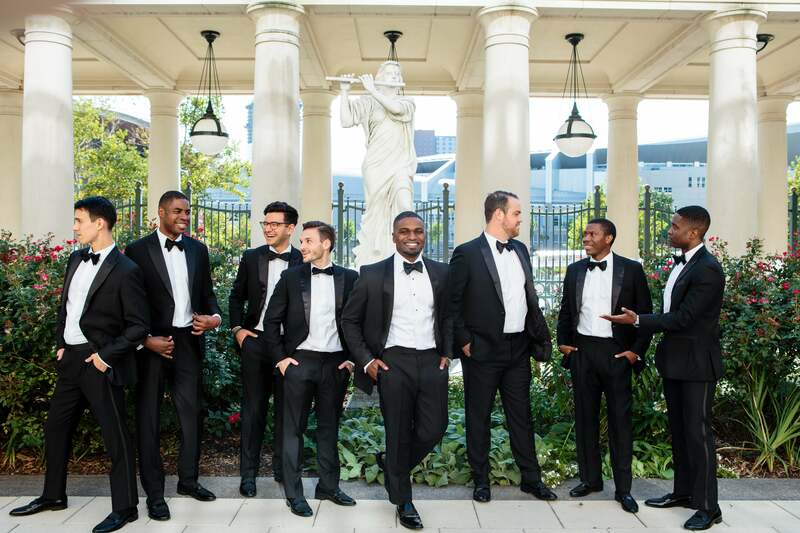 "My groomsmen and I became closer during the entire process, which was important to me because I hear all the time that people often lose friendships during weddings and the lead-up. I didn’t want that. I selected my guys based on what they meant to me in life and I wanted them to know that." 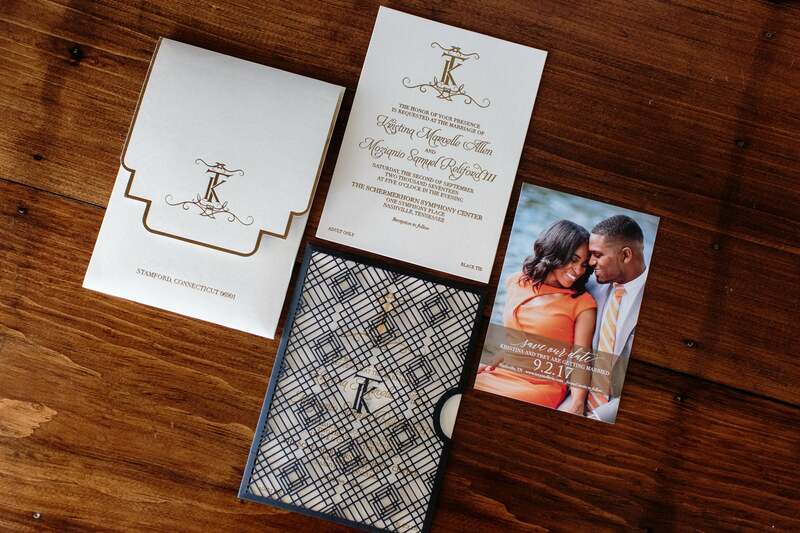 We definitely love Kristina and Trey's save the date and wedding invite! 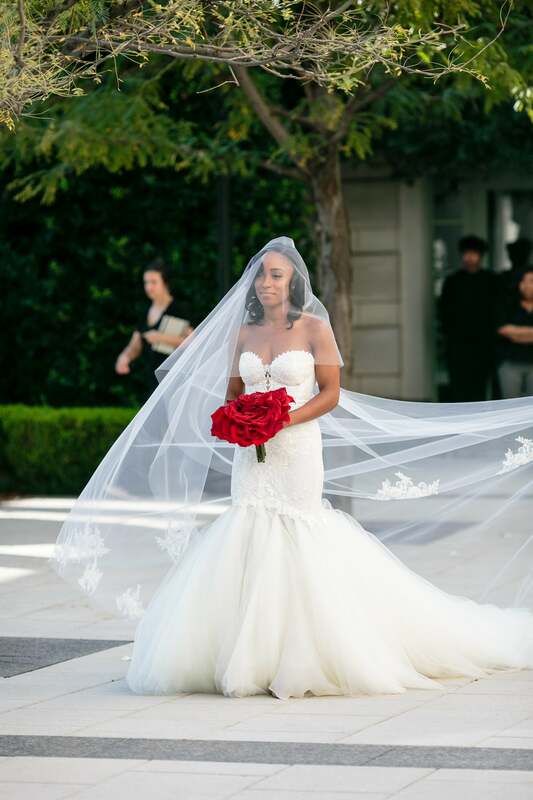 "To commemorate my mother who passed away five years ago, I walked down the aisle alone carrying a red rose glamelia bouquet," said the bride. "My mother’s favorite flowers were red roses." 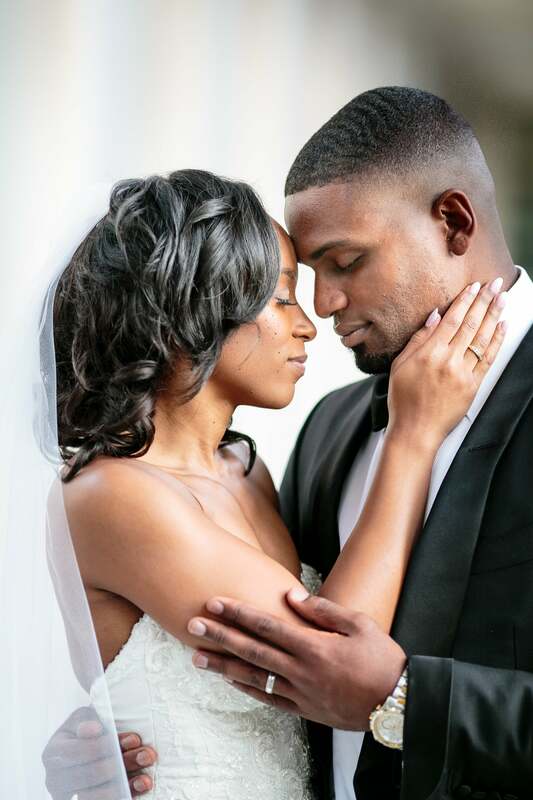 "I felt like a winner, like the luckiest man in the world and I know I was and am," said Trey of looking at his bride at the altar. "I felt incredibly lucky and completely at ease," said the bride of being with the altar with the groom. 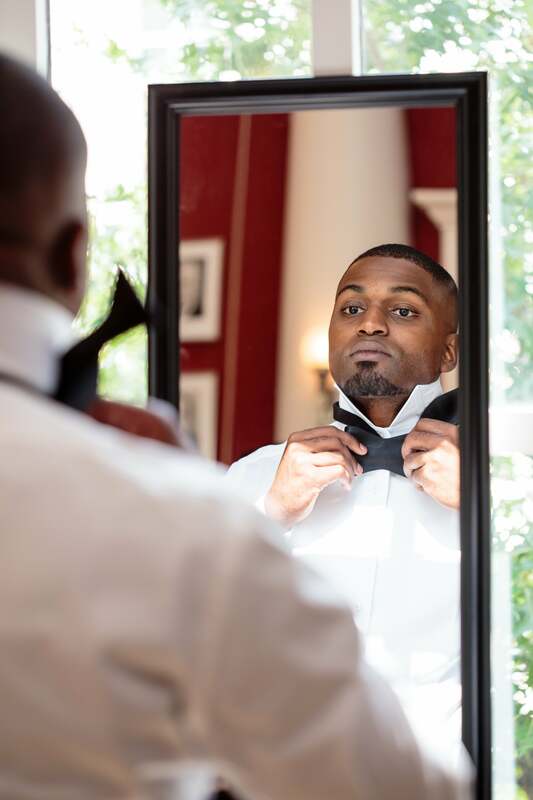 "I was a wreck the hour or so before our ceremony but once I looked into Trey’s eyes, everything just fell into place." 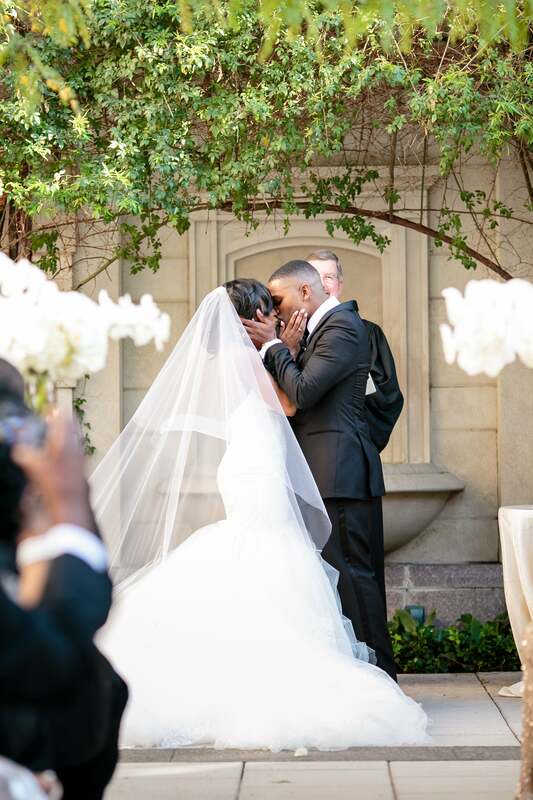 "Our first kiss as husband and wife was one of my favorite memories of the wedding," said the bride. 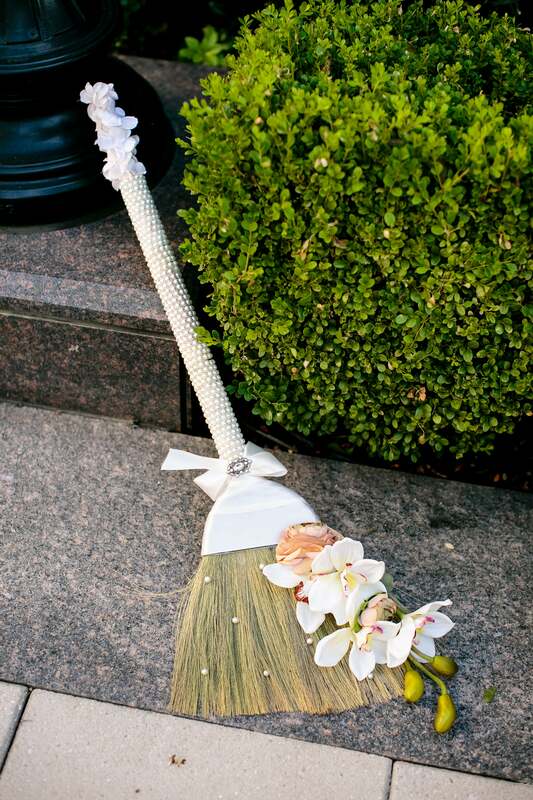 "We jumped the broom to pay homage to our ancestors and remember the luxuries we have today that they didn’t have. Both of us are Black Americans, descended from slaves and proud of how far our families have come despite what our ancestors went through. The tradition was important to us for that reason since neither of us is so closely connected to our African past necessarily because of the years of distance the institution of slavery caused. 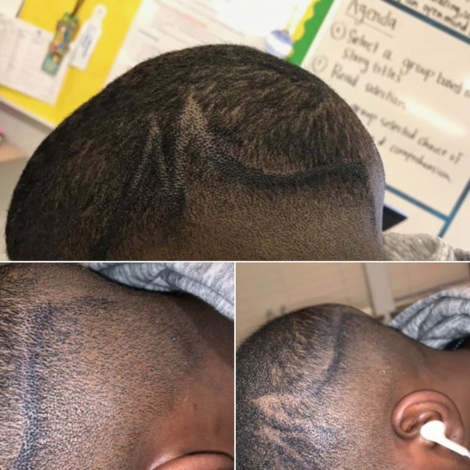 It meant a lot to include the tradition and I hope our kids do as well." Introducing the Mr. and Mrs! "I knew Kristina was the one following an escape to Canada," recalled the groom. "One random weekend during the summer, we both decided to take the day off and go to Osheaga Music Festival in Montreal. We rented a car, drove up and sparks flew. It was an amazing trip and I knew I had my paradise partner then." 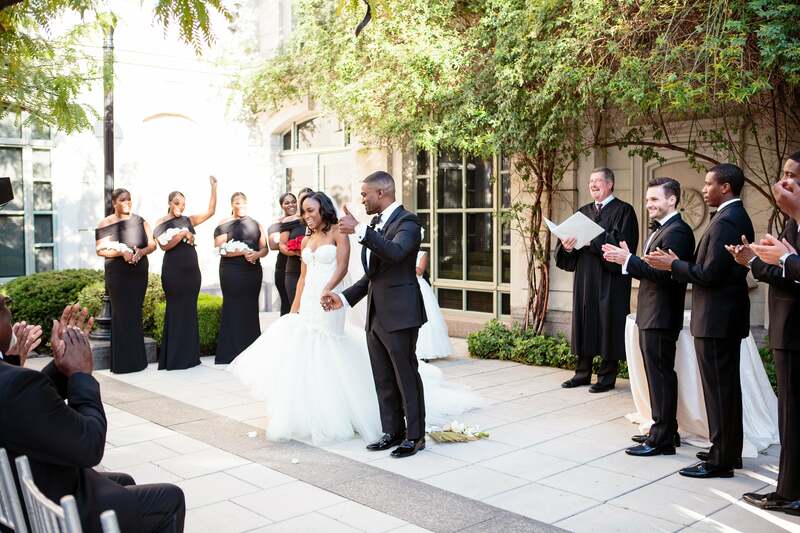 "This is going to sound extremely cliché, but Trey is my best friend," said the bride. "I couldn’t imagine going through life without him. I’ve never been more “me” that I am with him – he completes me." 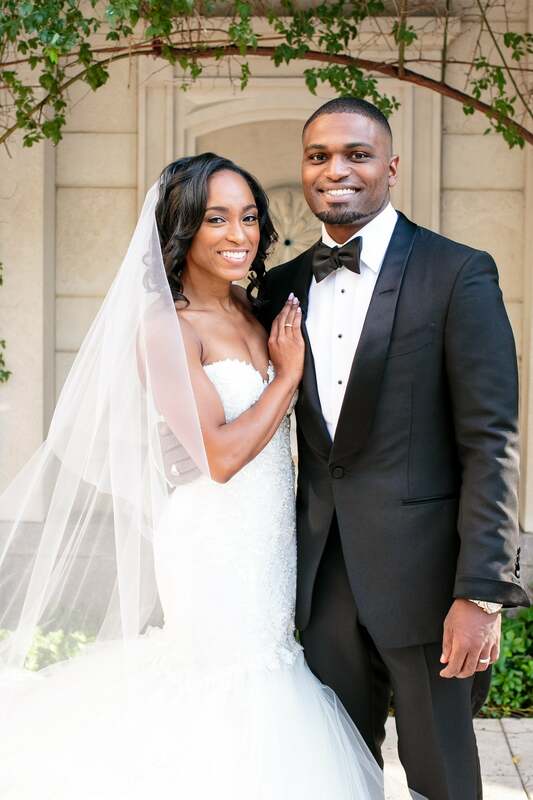 "I chose Kristina because she is loving, incredibly thoughtful, competitive, and driven," said Trey. "She loves life and loves experiencing new things, yet she can take a step back and appreciate going slow at times. She is my soulmate and she completes me; without her, I’d be half the person I am." "I’ve always believed that true love comes when you least expect it – you can’t seek it out or make it happen. It’s natural and has a way of sneaking up on you. Trey has proved every fantasy of love I could have ever imagined. I was at a point in my life where I was uninterested in dating and had made a conscious decision to focus on growing as an individual. In fact, my attendance at the La-Tex Crawfish Boil (where Trey and I met) was supposed to be my official “in these streets” coming out party! Boy, was I wrong?" 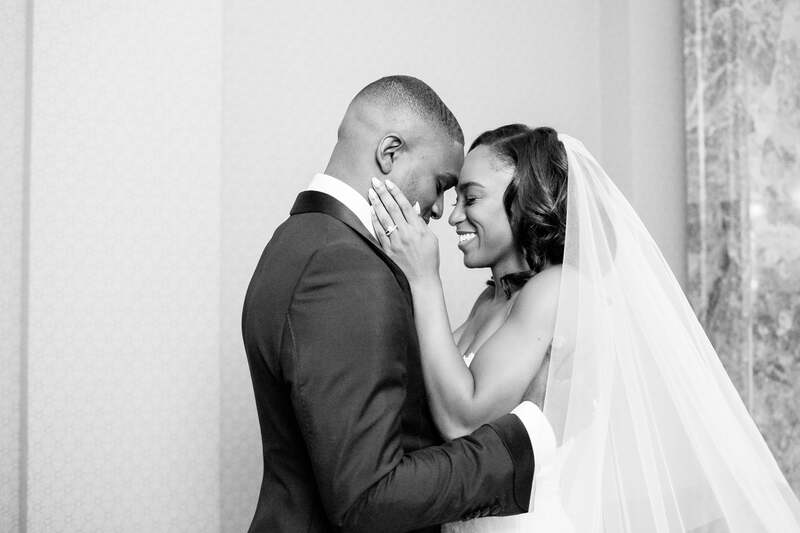 There is no denying that Kristina and Trey are madly in L-O-V-E! "Trey and I met during a random encounter at the La-Tex Crawfish Boil in Brooklyn, New York," recalled Kristina of first meeting her groom. "My cousin stopped a guy wearing a “Vote for Me” t-shirt (Trey) to take a photo of us using my phone. After about 30 different poses, I decided to put him out of his misery and retrieved my phone. Pleasantly surprised by his warm smile and easygoing nature, I introduced myself and, according to him, flirtatiously asked: “What are you running for?” From there, a love story was born." 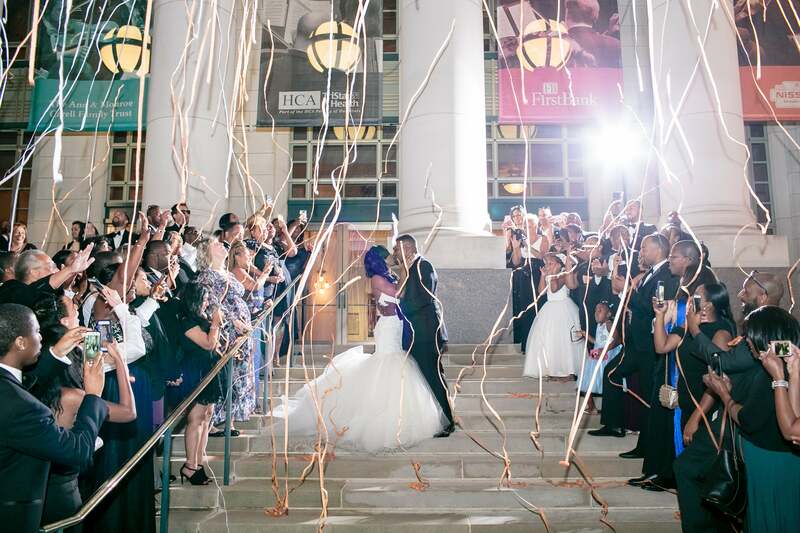 To witness their union, 135 of Kristina and Trey's closest friends were in attendance. 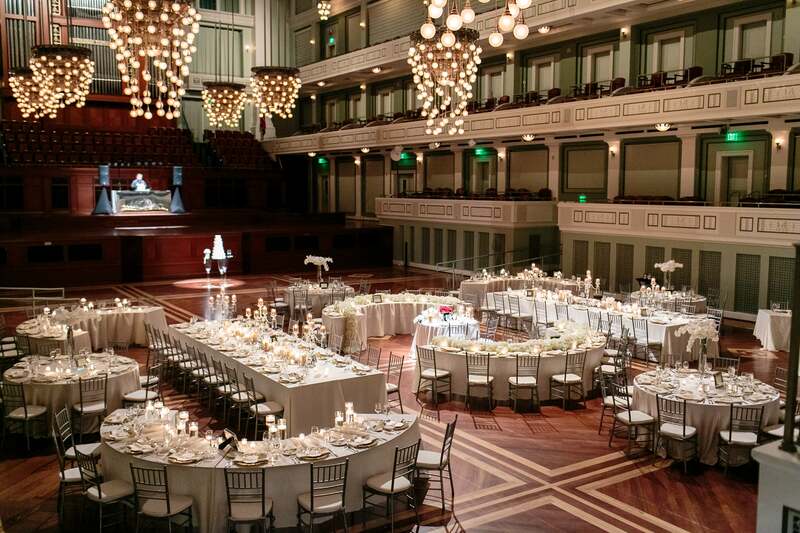 Their reception space was simply gorgeous! 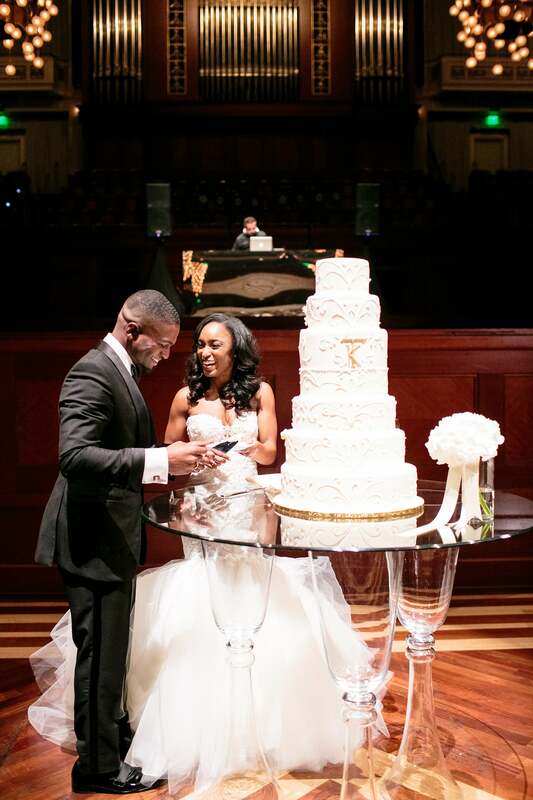 "Our cake was the perfect embodiment of our regal and classic theme. Our “TK” monogram was beautifully incorporated into the cake and I surprised Trey with a Tennessee Vols orange and white checkerboard on the inside of our cutting tier. The rest of our five-tier cake was strawberry cake with fresh strawberries and cream cheese frosting. YUM! " 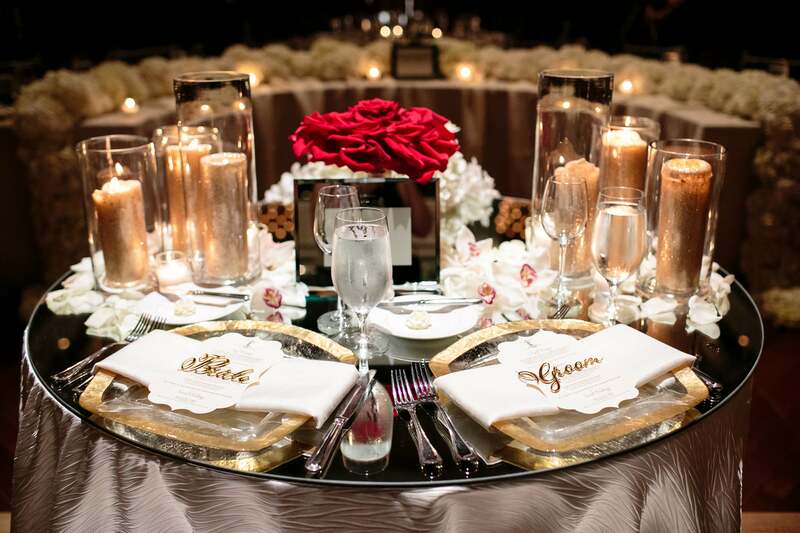 "Our sweetheart table was breathtaking! There was an incredible all-white arrangement of white Phalaenopsis orchids, white hydrangea and white roses accented by tons of candles." 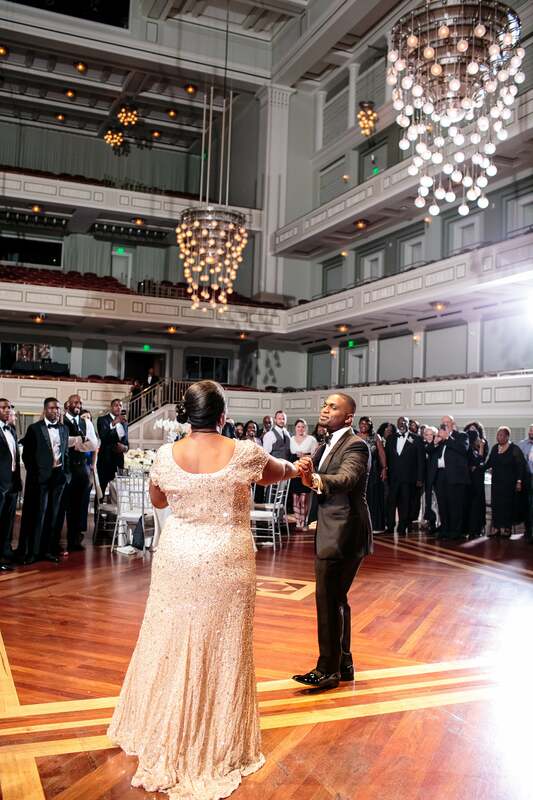 On his wedding day, Trey danced with his mom to Boyz II Men's classic song, "Mama". Aww, how sweet! 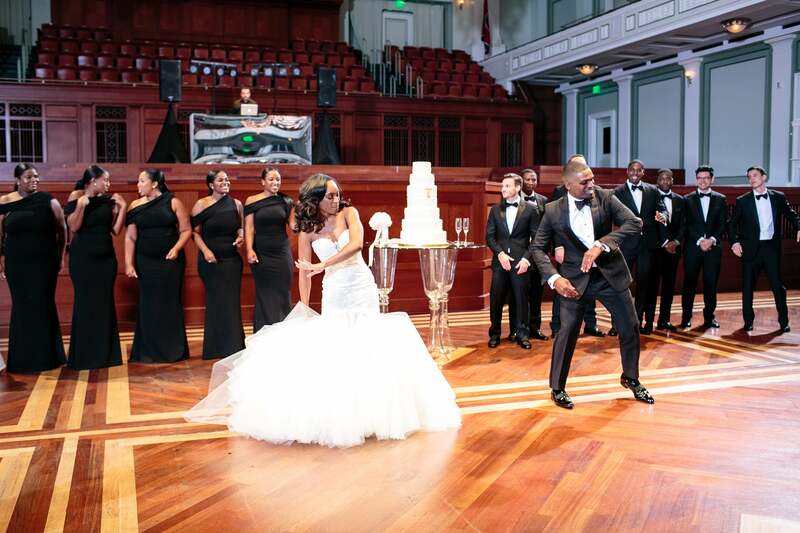 It definitely looks like Kristina and Trey had a grand ol' time on the dance floor!